Here’s something for you to cook this weekend, something from the archives. It comes from The River Cafe Cookbook, a book I no longer own, but no matter. It’s an easy enough recipe, I have it memorized. So easy: I can squeeze it all into this paragraph. Boil a pot of water, add salt. In a large skillet, add cubed pancetta–about two big slices worth. Add a splash of olive oil, raise the heat and let the pancetta start to brown. When it’s getting closer to brown than not-brown, add broccoli florets–about two heads worth–to the salted water. Add 2 or 3 cloves of slivered garlic to the pancetta and some red pepper flakes. (Watch the garlic: don’t let it burn.) When the broccoli is just cooked, but still al dente (1 or 2 minutes) lift with a spider into the skillet with the pancetta and garlic. Now drop a 1 lb box of orecchiette into that same salted broccoli water; stir it all around so the pasta doesn’t stick to itself. 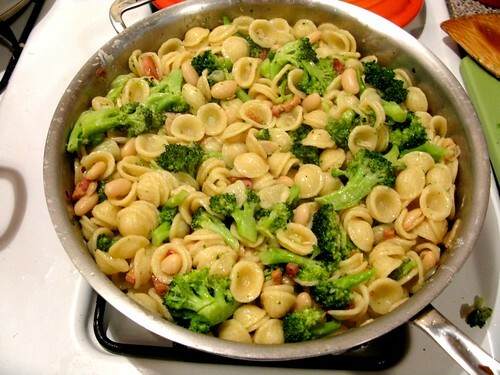 Lower the heat on the broccoli and if the pan is too dry, add some pasta cooking water. Keep it on the lowest flame while the pasta cooks. When the pasta’s just al dente (9 minutes later) add with the spider to the skillet with the broccoli and pancetta (it’s ok if some pasta water gets in, it helps make the sauce). Toss all around until everything’s coated and the pasta’s totally cooked through and then, off the heat, add copious amounts of Parmesan cheese and one final drizzle of olive oil. Magnifico! There you have it: Orecchiette with Broccoli & Pancetta.